Aug. 2, 2016, 2:37 p.m.
Time for new grips. The Lizard skin Chargers are dead. Suggestions? Looking for something a little more plush if that makes sense. Aug. 2, 2016, 3:02 p.m. 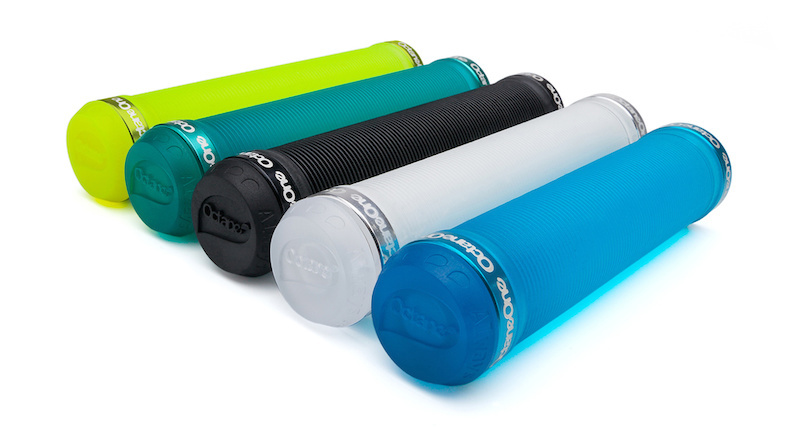 The Easton lock-on grips, they come in different thicknesses, I like the thick ones. Aug. 2, 2016, 3:23 p.m. Grips are a personal thing, for sure. I have typically enjoyed ODI Ruffians, but find they don't offer much grip after they have worn. ODI Troy Lee have been my choice recently. Aug. 2, 2016, 3:32 p.m. I was getting numbness in my hands with the Chromag grips I was using, especially on longer climbs. It's been about six rides now with a set of Ergon GA2 on there and they've been great so far. Aug. 2, 2016, 3:43 p.m.
ODI TLD for me too. Aug. 2, 2016, 3:50 p.m.
Been doing lots of riding this summer and finding my hands are getting sore quicker than usual . Thinking if I go with a thicker grip may remedy the situation with a slight diameter change. Especially my DH bike. Aug. 2, 2016, 4:09 p.m.
Aug. 2, 2016, 4:33 p.m.
Aug. 2, 2016, 4:49 p.m. I canât stand grips with a lock ring on the outside. Just picked up a set of the DMR Death grips in thick version with the soft compound to replace my worn out single ring Kona grips. They wedge onto the bar, in addition to having a lock ring, to provide a secure fit without worry of rotation. I thought the inside flange may get in the way of accessing my dropper actuator and shifters, but it is a non issue; in fact I like them. Theyâve only been on the bike a couple weeks so I have no idea as to how fast theyâll wear down. Aug. 2, 2016, 5:14 p.m. I run ODI Cross Trainer. Ribbed for my pleasure. Aug. 2, 2016, 5:34 p.m.
Ive been ridinf with ge2's for couple years getting worn now was looking at the ga2 's .. Can you swap the lock ring for a lev remote?? I don't think so. They only have the inner ring and its wider than the ODI ones. Aug. 2, 2016, 6:03 p.m.
i have ergon ge1's and like them but they are quite firm, almost hard. kinda wish i read further about the ga2's. they say it's their softest and gripping them in the store, i can see they are. probably what i'd prefer. i have really liked the easton lock on but have a grudge against outer locking rings these days. my bike's bars have a way of scratching my truck, it's back window's and anything it leans and falls against. liking the single inside lock ring grips but for pure death grip comfort, the easton 33mm's were the best. Aug. 2, 2016, 7:01 p.m. I lately switched from a lifetime of Ruffians to RF Half Nelsons. (And ESI's for a while, but that habit got expensive quick). On my second pair of Nelsons now, very happy with this grip. I rotate the ridges so they're under my palm for extra squishyness, while retaining a slim feeling on the finger tips side. Also this grip comes in so many colors only a mantis shrimps can see them all. Ruffian comes in a plethora of different styles now too, some with extra padding. Chromag Basis is very popular…but it is a double clamp grip.